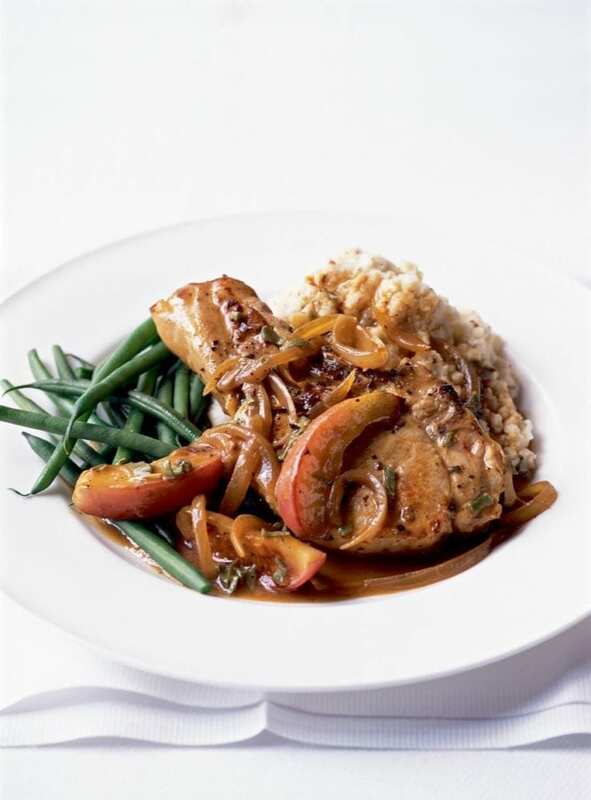 This pork recipe is low fat, low-salt and a good source of B vitamins too. Boil the potatoes in a saucepan of lightly salted water for 15 minutes. Meanwhile, season the pork chops and fry in half the oil in a large, non-stick frying pan over a high heat for 2-3 minutes, until browned on both sides. Remove and keep warm. Add the apples to the frying pan and brown on the cut sides. Remove and keep warm. Add the onions with 200ml boiling water and simmer for about 5 minutes, until reduced. Add the remaining oil and stir until the onions are caramelised. Stir in the garlic and flour and cook for 1 minute. Gradually stir in the cider, then place the pork chops back in the pan with the apples, vinegar and sage, and simmer for 10 minutes. Meanwhile, drain and mash the potatoes, stirring in the mustard and yogurt. Season well and keep warm. Remove the chops and simmer the sauce for 5 minutes to thicken, then season well. Divide the mash between plates, place a chop on each, pour over the sauce and serve with some cooked green beans. Pork fillet medallions would also work; tenderise them and add to the pan after the apples have been cooking for a few minutes.